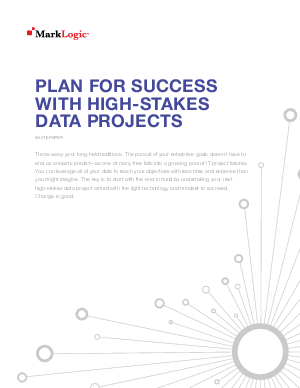 Your high-stakes data projects don’t have to end – as analysts predict – in failure. Don’t just rely on legacy technology and outdated thinking - the key is to start your next data project armed with the right technology and mindset to succeed. This paper will give you insights and guidelines to help you learn how to leverage all of your data to reach your data integration objectives with less time and expense than you might imagine. Change is good, and in this paper we’ll give you real-world examples of organizations that embraced change and found success.